This is not a trip report with a map or a location. Rather, it is an encouragement to study maps, dig for clues in old books and online and go out and find an amazing spot that is new to you and do something cool there. Saturday may have been the last summer like day of the year. An arctic blast arrived Sunday afternoon and the mountains are now sprinkled with snow. Taking advantage of splitter blue skies Saturday we set out to hike another new-to-us bitterroot peak. 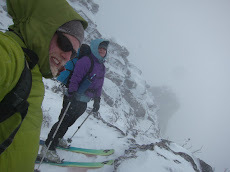 We found excellent warm fall conditions and a stunning spot we are sure to revisit on skis. Yet another reminder of what brought us to Montana and why we created Hillmap. Sunday I prepped ski gear. More on that later. Somebody dug up a bee hive for a snack.